Photo courtesy of Sena Boles. Coming to a carpark or sidewalk near you. Uncooked fish prepared by the roadside. What’s not to trust? Finally a restaurant that doesn’t constantly misplace their sushi dishes. I hate having to search for my food. Last sushi bar for 12 exits. I will wait for 1.01 upgrade. apparently the fish doesn’t think so..
Not kindly for the poor fish! I practice zen tipping. How much tip can you hold with one hand clapping? I really hope it’s in a good place. I don’t intend to eat Sushi while it’s still alive. 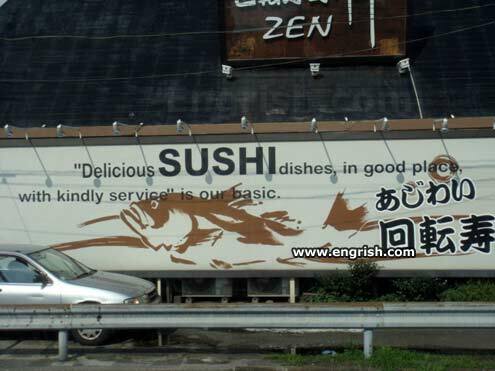 Delightful dishes indeed. Keep the sushi, though. The car is for place not so delightful. I’ve always wondered about Zen. Now I know it’s about fish. We batter the fish by running over it with a car. It is a cross between Sushi and Tempura. Sure, the dishes taste good, but they’re really rough on my dental work. For extra big tip we take care of you in front seat of silver car. If you know what we mean. Sushi, like music, is basic. I just eat here to get kindly serviced.